Each DarcMoon piece is constructed with natural gemstones; all holding different healing properties and intentions. 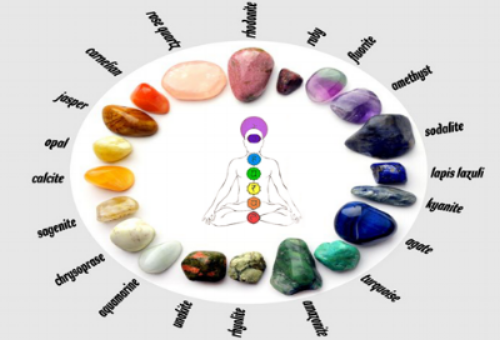 Lean more about each gemstone below and see how they can benefit you or a loved one! DarcMoon@yahoo.com or fill out the Custom Order submission form. African Turquoise is said to be the stone of evolution, bringing about great change and transformation within life. Its encouraging energy opens the mind to possibility of newness. This stone helps us to see the need for development and metamorphosis. It will renew your spirit, energy and path in life. African Turquoise resonates with the 3rd Eye Chakra, leading its wearer to greater wisdom. Agate is a grounding stone. It brings emotional, physical and intellectual centering & stabilizing energy. Agate has the power to harmonize yin & yang; the positive & negative forces that hold the universe in place. It is a soothing and calming stone that brings great strength and self-analysis. It stabilizes the aura. Amazonite has a powerful filtering action. It absorbs microwaves, cell phone emanations and protects against electromagnetic pollution. It is an extremely soothing stone and filters information. It calms the brain and nervous system; aligning the physical body. Amazonite balances the masculine and feminine energies and many aspects of the personality. It opens the Heart Chakra and enhances loving communication. Amethyst is an extremely powerful and protective stone with high spiritual vibrations. It guards against psychic power. Its serenity enhances higher states of consciousness and meditation. Amethyst has strong healing powers. It eases headaches and releases tension. It is an excellent cleanser for the blood. Also, enhances memory and improves motivation. Amethyst stimulates the Crown and Throat Chakra. Ametrine is a beautiful blend of amethyst and citrine. A good combination of yin & yang energy that can balance the mind and heart. When worn it will promote calm and rested states of mind that can lead to powerful meditation. This stone will help cleanse the aura and recharge the body so goals can be accomplished on time and with vigor. Worn it will encourage optimism and open the Third Eye Chakra. Angelite is a stone of awareness. It helps you speak your truth and enables you to be more compassionate and accepting of what you cannot change. It is a great healing stone, which deepens attunment and heightens perception. As it name suggests, Angelite facilitates conscious contact with the angelic realm. Opens Throat, Third Eye and Crow Chakras. Annabergite teaches you that everything is perfect just the way it is. It is a healer and a guide. This stone assists in any life changes and transformation phases: serving us while needed. It is soothing and mystical. Aventurine is a great stone to help encourage decision making and leadership. Aventurine also stimulates your creative energies, while stabilizing our mind and body. This stone can protect and nourish the Heart Chakra, helping to alleviate anger and uncertainty. Wearing this stone promotes a great feeling of wellness and happiness. Black & White Agate has the power to harmonize yin & yang, the positive & negative forces that hold the universe in place. A soothing and calming stone that brings great strength. Its multiple layers can bring hidden information to light. Brings an emotional, physical & intellectual balance. Builds self-confidence and aids self-analysis. Bloodstone can be worn as a stone of protection and can guide you to have the appropriate courage when needed. It increases mental clarity and aids in decision making. Bloodstone provides a mental boost when motivation is lacking, and can revitalize the mind and body if you are exhausted. It stimulates dreaming and heightens intuition; it is a great stone for creativity. Aids in avoiding dangerous situations. Stimulate the Root Chakra. Blue Goldstone is said to help one stay calm and stabilize the emotions. It can be used as an energy generator and can deflect unwanted energies, making it used as a protection stone. Goldstone is a manmade stone. Brown Jasper is connected to the Earth; this stone encourages awareness and stability. It is a stone of balance and harmony; internal and external. It enhances a state of meditation. It is a great tool for grounding and centering the body; and aids is in connecting to the Root chakra. Brown Jasper stimulates the cleansing organs. Carnelian grounds and anchors you in present reality. It is a stabilizing stone with high energy. It is excellent in restoring vitality and motivation, and for stimulating creativity. It is useful for dramatic pursuits. Carnelian gives courage, promotes positive life choices, dispels apathy, and motivates for success in business and other matters. Activating the Root Chakra. Cedar Wood - The cedar tree has been revered for its spiritual significance for thousands of years. Its wood was burned in cleansing ceremonies for purification and used for the doors of temples. The tree was thought to house the important gods and to be an entrance to higher realms. Chalcedony is a nurturing stone that promotes goodwill. It can be used to assist through transitions. This stone absorbs negative energy and dissipates it to prevent onward transmission. Chalcedony brings the mind, body, emotions and spirit into harmony. Cherry Quartz enhances energy by; absorbing, storing, amplifying, balancing, focusing and transmitting it. It channels universal energy. Cherry Quartz also enhances your thoughts, being as they are a form of energy. Since it directs and amplifies energy, it is extremely beneficial for manifesting, healing, meditation, channeling and protection. It is also beneficial for storing and retrieving information of all types, information is a form of energy patterns. Chrysocolla is a tranquil and sustaining stone. It helps with meditation and peace. Chrysocolla aids you in accepting situations that are constantly changing with serenity; invoking great inner strength. It heals, calms, cleanses, re-energize all the Chakras and aligns them with the Devine. Citrine is a powerful cleanser and regenerator. It is warming, energizing and highly creative. It acts as an aura protector and has the power to cleanse the Chakras. It stimulates the Sacral Chakra and opens the intuition in the Crown Chakra. It raises self-esteem and self-confidence, and removes destructive tendencies. Crystal Quartz is the most powerful healing and energy amplifier. It protects against radiation and is a deep soul cleanser. It also stimulates the immune system. Crystal enhances psychic abilities and attunes you to your spiritual purpose. Fire Agate carries a great mystery locked deep in its crystal . Agate helps you guide through your actions, it aids in decisiveness under unclear circumstances. It increases; passion, emotions and reconnects to one's deepest desires. It provides the courage to take risks to fulfill those promptings. Fluorite is a extremely protective stone. It cleanses and stabilizes the aura, drawing off negative energies of all kinds. Fluorite is associated with progress on many levels and structure to daily life. It has a stabilizing effect on the mind and emotions. Gaspetite is a healing stone with the power to overcome bitterness or grudges. It is a great tool for meditation and release; connecting us to our earthy mother. Wearing this stone can aid in shamanic journey or spiritual transformations. Supports the liver and intestines. Hematite is a particularly effective at grounding and protecting. It harmonizes mind, body, and spirit. It dissolves negativity and prevents negative energies from entering the aura; restoring peace and harmony. Used during out of body journeying, it protects the soul and brings it back into the body. It is said to be useful in legal situations. It boosts self-esteem and survivability. Jade is a symbol of purity & serenity. It attracts good luck, friendship & love. This stone soothes the mind and stimulates ideas. It is a powerful stone for the Heart Chakra. It is a protective stone which keeps the wearer from harm & brings harmony. Jasper is a supreme nurturer. It brings tranquility and wholeness; aligning the chakras and aura. It can facilitate shamanic journey and dream recall. Jasper is a protection stone and it provides balance for Yin & Yang. It aligns the physical, emotional and mental bodies. Encouraging honesty within you. Lapis Lazuli is known to be one of the oldest spiritual crystals. It is a powerful crystal for activating the higher mind and enhancing intellectual ability. It is an excellent stone for stimulating wisdom and good judgement. It stimulates the desire for knowledge, truth and understanding, and aids the process of learning. It aids in opening the Third Eye Chakra and balancing the Throat Chakra. Larvikite is a very mystical and esoteric stone. It helps us connect to our ancestors, guides and higher consciousness. Larvikite revitalizes and promotes youth. Stimulating your Root Chakra. Lava Rock is not your typical stone; it comes directly to us from the center of the Earth. It is highly effective in grounding and connecting us to our ancestral roots. Lava has a way of calming the mind and emotions, it is a potent healer. It is the most primordial stone you can wear or use for mediation. When worn, it can instill confidence and instinctual nature. Lava is effective in stabilizing the Root Chakra, which helps us to make decisions and trust those decisions. Lotus Flower is a potent symbol that grows strong and beautiful from the murkiest depths. It resembles the purifying of the spirit which is born into murkiness. It also symbolizes those who are working to rise above the muddy waters who will need to have faith in the unknown. It is one of the eight auspicious symbols and is a symbol for the progress of the soul through muddy materialism, all the way to bright and sunny enlightenment. The lotus is the national flower of both Vietnam and India. Magnesite brings a deep peace to mediation and relaxation. It opens and stimulates the Heart Chakra. Including love for the self, which is necessary before you can accept love from other people. Magnesite brings a calming effect to the emotions, promoting tolerance for emotional stress. It aids people who are nervous and fearful, helping them overcome irritability and intolerance. Malachite is known to be a stone of transformation. Malachite encourages change and risk-taking. It assists in making these transformations and eases the transition from one state to the other. Malachite is a great protection stone, absorbing negative energies and pollutants from the atmosphere and the body. It guards against radiation of all kinds, and clears electromagnetic pollution. Moonstone is a "stone of new beginnings." As its name suggests it is highly connected to the moon and intuition. Its most powerful effect id calming the emotions. It can enhance psychic abilities and connect with you higher consciousness. Moonstone can soothe emotional instability and stress, improving emotional intelligence. . .
Muscovite s a mystical stone, stimulating awareness of the higher self. Muscovite opens the Heart Chakra, your intuition and psychic vision. It is a reflective stone, mirroring back and allowing you to recognize what you project. Muscovite also aids in problem-solving and clear expression of thoughts and feelings. Om Mani Padme is a six-syllable Sanskrit mantra. Om Mani Padme Hum cannot really be translated into a simple phrase or sentence. It is said that all the teachings of the Buddha are contained in this mantra. The first word Om is a sacred syllable found in Indian religions. The word Mani means "jewel" or "bead", Padme meaning "lotus flower", the Buddhist sacred flower, while Hum represents the spirit of enlightenment. This six-syllable phrase which can be transliterated to "Hail the Jewel in the Lotus" is an invocation mantra of the Avalokiteshvara, the Bodhisattva of Infinite Compassion who protects one from harm. Onyx is a strengthening stone. It provides support in difficult or confusing circumstances and during times of enormous mental or physical stress. Onyx promotes vigor, steadfastness and stamina. It aids learning lessons, imparting self-confidence and allow you to be at ease in your surroundings. Prosperity Mala - Multi-stone mala's are powerfully charged to balance your mind, body and spirit. The mixture of stones aligns with all 7 Chakras. Open yourself to abundance, fortunes and happiness in your life! Rainbow Agate brings abundance & fullness to all areas of life, including business & agriculture. It can be used to enhance the yield of crops or to maintain the health of house plants. It creates a peaceful environment and encourages the enjoyment of every moment. Rainbow Agate encourages you to remain centered in times of strife or confusion and brings stability. Red Jasper is the stone of endurance. It alleviates stress and reconnects with Earth's grounding energies. Its cleansing effect eliminates negativity, returning it to its source, and stabilizing the aura. It is an ideal worry or rubbing stone for soothing the nerves and restoring balance. Red Tiger's Eye is a stimulating stone and can support motivation. It aids in enhancing self-confidence and self-esteem. Red Tiger's Eye is said to help you have the practicality and willpower to take care of yourself fully. It is a survival stone and can help with the correct use of power for survival in difficult times. It can also bring vitality. Rhondite is a that correlates the Heart Chakra. It helps bring harmony and balance, both to ourselves and our relationships with others. It enhances our universal and self-love. This stone not only stimulates, but also clears and activates the Heart Chakra. It provides a good grounding energy and balances Yin-Yang energy as well. Rose Quartz is the stone of unconditional love and infinite peace. It purifies and opens the Heart Chakra. Bringing inner healing and attracting love. It restores trust and harmony and draws off negative energy. Replacing that energy with loving vibes. Rose Quartz is used to raise self-esteem and self-worth. Ruby Zoisite is a magical stone, it allows you to access your highest psychic abilities. It is the stone of empowerment. It enables you to better utilize your talents and abilities of the mind. It stimulates the Crown Chakra as well as the Heart Chakra. Rudraksha Seed, Tear of Shiva. This represents compassion. It is a seed that has fallen before fruiting - which is auspicious in Vedic culture. It is worn to represent Shiva, the God of Destruction, and the male creative force in the world. Serpentine is an earthing stone that aids meditation and spiritual exploration. Clearing the chakras and opening the Crown Chrakra, it helps you to understand the spiritual basis of life. Serpentine helps you to feel more in control of your life. It corrects mental and emotional imbalances and assists the conscious direction of healing towards the problem areas. Sodalite unites logic and intuition. Sodalite is a stone that is good for healing breaches in communication. It is a stone of truth, and allows this in all forms of communication. It correlates to the Throat Chakra. Snow Flake Obsidian connects with the Sacral Chakra. It is calming and soothing. Snow Flake Obsidian brings your attention to ingrained patterns of behavior. It teaches you the value of mistakes as well as success. It helps you recognize and release negative thinking. Smoky Quartz is one of the most efficient grounding and anchoring stones, which is great to use during meditation. This protective stone has a strong link with the earth and Base Chakras. This stone is great for stress and aids with toleration during difficult times. It has a grounding spiritual energy and gently neutralizes negative situations. Snow Quartz supports you while learning lessons and helps you let go of overwhelming responsibilities & limitations. Enhancing tact and cooperation. It helps you think before you speak. When used in meditation, it links to deep inner wisdom previously denied in yourself and society. Its effect is slower and gentler but nevertheless effective. Tourmaline cleanses, purifies and transforms dense energy. It grounds, clears and balances all the chakras. It is a useful healing tool, dispersing negative energy. Tourmaline aids in understanding oneself and others, taking you deep into yourself, promoting self-confidence and diminishing fear. It can clear negative thoughts, dispersing tension and stress. Tree Agate is a calming and centering stone. Meditating with Tree Agate deepens you meditation and connects you on a deeper level with Earth and nature. It clears blockages within your body's energy to open the flow of abundance and prosperity. It also aids in boosting the immune system. Turquoise is the most efficient healer, it is a protective and purification stone. It provides solace for spirit & well-being for body. Solves problem & calms the nerves. It is believed to change color to warn of danger of infidelity. Placed on the third eye it enhances intuition and meditation. On the Throat Chakra, it releases old vows, inhibitions and prohibitions, and allows the soul to express itself once more. It explores past lives and shows how the creation of your "fate" is ongoing and depends on what you do at each moment. White Howlite is the stone of awareness. It can prepare the wearer to receive wisdom and attunment from the Higher Self. It is also used for dimensional travel and healthy meditation. Howlite can be used to release attachments, or cords, that are linking to the present. Once those cords are severed, it allows for both processing those emotions ad bringing peace in those areas. White Turquoise is a wonderful stone for calming upset states of mind and emotion. White Turquoise decreases an overly critical state of mind, selfishness, stress, and anxiety; bringing calm and relaxation. White Turquoise also can decrease anger originating from within or externally. The wake of such calming can help one be truly comfortable as oneself without the need to pretend to be anything but what you are. Yellow Agate helps stimulate the Solar Plexus Chakra. It is a grounding stone that helps generate confidence and courage. Yellow Agate has the power to balance Yin & Yang. It is a stone for strength and aids in self-analysis and self-awareness. Zebra Jasper can show us our own true nature and help us see past illusion. It is a grounding stone which connects to the Earth. Zebra Jasper is an effective aura protection stone. It brings you a sense of ease and that in the end, all will be as it should. Zebra Jasper stimulates the Root Chakra. Zoisite is an earthy stone; which helps stabilize and assist in transition. It is a good stone for both the Heart and Root Chakras. It encourages one to pursue truth and justice, while still staying true to oneself.